Clay pot filter manufacturing can take place locally, in a small factory where the quality of the materials and construction can be assured. 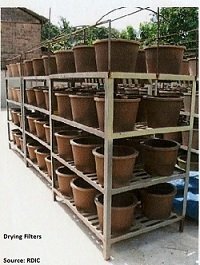 Any clay that is suitable for other pottery processes should be suitable for water filter production. However, high sand content in the clay can cause filters to break. Additionally, naturally high levels of organic matter in the clay can affect the strength and filtering capacity of clay pot filters, as this material can burn out during firing, leaving behind large and unregulated additional cavities. Clay may be used directly from the pit where it is dug, or as unfired bricks from a factory. The clay needs to be completely dried prior to use so it can be crushed into a powder and evenly mixed with other components. Materials that may be suitable as organic burn-out material include: rice hulls, saw dust, recycled paper, and coffee grounds. It is important to use materials that are most appropriate for the region. The size of the material and the amount mixed in with the clay will affect the flow rate of the clay pot filter element and, therefore, the filter effectiveness. Testing is essential when developing a clay pot filter program in order to determine the best burn-out material and its application. A reliable and reasonably clean source of water is also required for construction of the clay pot filter elements, and for flow rate testing. The raw materials of crushed/ground clay, organic burn-out material, and water are combined to produce a homogenous working material. The wet clay mix is formed into cubes for pressing. The cubes are kneaded, turned, and thrust against a tarpaulin to remove air bubbles in the mix prior to pressing - and therefore to reduce imperfections in the clay. 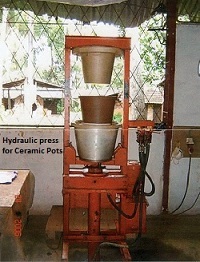 Clay cubes are pressed in a hydraulic press. The use of a hydraulic press greatly decreases labor requirements of the shaping process, and greatly increases efficiency and consistency of the product. The clay cubes are pressed between a male and female mold which are covered with plastic bags to prevent sticking. The hydraulic press incorporates a fixed plate in the bottom mold which pushes the pressed filter element out as the mold opens up. Minimal surface finishing is required following molding but is conducted to ensure the rim is strong, and that the surface is even. Filters are labeled to indicate the date of pressing, the batch and the filter number. Drying of filter elements removes the excess water in preparation for firing in the kiln. If water is not removed prior to firing it will heat up, evaporate, and expand, causing the filter to crack. By the completion of the firing process, filter elements will have lost over 3 kg of water from when they were first pressed. The initial drying of filter elements is on drying racks in the air. It removes much of the excess water required for molding the clay to the desired shape. After this initial drying period the filters are able to hold their shape but are not strong, and remain water soluble. The firing process begins with a low heat of around 100 degrees C, which removes the remaining excess water. Further heating then removes water chemically bonded to the clay’s alumina and silica molecules. Vitrification: finally at high temperatures (over 600 degrees C) vitrification of the clay occurs where the silica and alumina molecules melt and bond into a new mineral with fibrous needle like structures. Vitrified clay is hard, resistant to stress, and will not change shape when water is added. After vitrification the clay has a new chemical structure and cannot be reduced to powder and reused as clay dust. When heated to high temperatures the organic burn-out material leaves behind air pockets in the clay. These air pockets thin the walls of clay through which the source water moves through the filter increasing the rate of flow, while still requiring the water to pass through the closely packed vitrified clay which removes the dirt and pathogens. Flow rate testing is an important quality assurance step which indicates the rate at which water passes through the clay pot filter element. Once a clay formula and production process has been established, flow rate testing should be conducted on EVERY filter element that is produced to ensure its viability. A high flow rate is an indicator of cracks or imperfections in the filter element that could reduce the effectiveness of filtration and may not remove the required bacteria, parasites and other impurities. Additionally a high flow rate reduces the exposure time of the filtered water to the silver solution thereby reducing the ability to kill bacteria in the water. A flow rate that is too low may prove impractical for use by households who may choose to stop using the filter and thereby waste their investment and put their health at risk. Silver is recognized for its ability to kill microorganisms. Colloidal silver has been used in hospital and clinical settings as an antimicrobial agent for cuts, burns, and in preventing eye infections in newborns and for disinfecting drinking water and swimming pools. Silver is used by NASA for purifying water for space flights (NASA CASI, 2007) and by airlines for in-flight water purification. A number of organizations manufacturing ceramic water filters paint them with silver, with very positive results. RDIC uses a 99.8% silver nitrate solution (AgNO3) for its silver. Approximately 30% of the silver is leached out when first used. While not dangerous, RDIC recommends that the 33 L of water filtered (3 pots full) are disposed of. The completed ceramic filter element is packaged together with the receptacle and the rest of the parts needed to assemble a complete filter. A PDF Manual covering clay pot filter manufacturing is available through RDIC that outlines, in detail, the process of setting up a ceramic pot filter manufacturing facility, and the equipment and processes involved in producing filters. Return to "Ceramic Water Filters" from "Clay Pot Filter Manufacturing"